See what our clients are saying about us! Email us your kind words and let us know how you feel! Had the pleasure of meeting Dr. Ortiz & staff in July 2014 after a referral from my Bulldog's former vet. I had inquired about acupuncture, hoping it would relieve my pet of arthritic pain, Spine pain, ( she was very weak in her hind legs, and couldn't walk well), and other severe, and debilitating symptoms of Inflammatory Bowel Disease. After meeting Dr. Ortiz and the staff, I was very hopeful he could provide my English Bulldog, Maggie May with a better quality of life. Her former vet ordered lots of expensive tests, and prescribed lots of expensive medications to accomplish this same thing, but not without horrendous side effects. I wasn't sure how acupuncture and an excitable english bulldog was going to work, but was willing to give it a try. Needless to say, he is now her full-time vet, and I don't believe my bulldog would be alive, and really thriving today if it wasn't for Dr.Ortiz. The acupuncture has made a huge difference in my bulldog. She is in minimal to no arthritis pain, is walking much better, and her bowel issues are completely under control. Dr. Ortiz is extremely knowledgeable, caring, and skilled in accupuncture, and all other aspects of vet care. I am a Surgical RN . I ask questions, and challenge treatments and medications when necessary, which does not bode well with most Vets. Dr. Ortiz is a great listener, encourages conversation, and is always accepting of my ideas regarding my bulldog's plan of care. I only wish I had engaged in his care of my bulldog sooner. You can not find any better, or more genuine caring and compassion than you receive from Dr.Ortiz and his staff. My Bulldog began with Acupuncture every week initially, and now has a very affordable treatment every 4weeks. A Simple change of her diet, and a natural herb is all it took to settle down her stomach and bowel. If you have ever wondered if acupuncture can really help with medical issues, I can tell you it can and does. My 8 year old English Bulldog is testimony to that. I went to him when my dog was really in a medical crisis, and in a very short time he turned her medical situation completely around, with not much more than acupuncture, diet change, and 2 herbal supplements. Acupuncture, organics, and herbs are not just for human beings! If you have a pet with medical issues that just can't seem to be resolved the conventional way, Give Dr. Ortiz a try. You will have your mind and your pet opened up to a whole new method of treatment , and a quality of life for you and your pet, that you never could of imagined. Thank you Dr. Ortiz and staff for saving my "Bully". ​Princess, my sweet twelve year old whippet, was diagnosed about 3 months ago with a tumor located between her right hip and thigh. I was determined to do whatever was necessary to prolong her life. The oncologist offered three choices: amputation of her right rear leg, chemotherapy / radiation or various medications to be experimented with strong side effects such as nausea, vomiting,… I did not like any of those options and searched for another vet with a more humane approach to treating animals. I found Dr. Raul Ortiz-Umpierre, a holistic veterinarian. Dr. Ortiz-Umpierre believes in herbs, herbal supplements and healthier and gluten-free food. Dr. Ortiz-Umpierre recommended acupuncture to help reduce her pain and to help relax her. I was willing to try anything. I did not know how she would react to needles being inserted along her spines and legs but she was a trooper. She did not cry or whine at all! The needles remained in her for 15 minutes. I was impressed and proud of her. Princess began this treatment once a week for about a month. She continues to receive acupuncture every 2 weeks. It has been 3 months now since she began. She appears more alert. Her strength has increased and there is improvement in her muscles.. There is less urination and she is sleeping better. I am thrilled with the outcome of the acupuncture and would recommend others to do this for their beloved animals. Dr. Ortiz-Umpierre has been so attentive to us. He explains things very clearly and follows up with phone calls after her appointments. He is concerned about Princess and I. He always listens so patiently to what I say. I am indebted to him for his kindness, professionalism and willingness to help my loving dog live life fully each day. I can't thank Dr. Ortiz and the staff at Stuart Animal Hospital enough. I carried my seven year old boxer "Stella" into SAH after being told by my ex vet there was nothing he could do for her, it was time to "put her down." After a thorough exam, as well as reaching out to her surgeon and former vet and a thoughtful and compassionate consultation, Dr. Ortiz provided us with a complete treatment plan consisting of diet, massage and medication. After only one day I saw improvement. It's now been five days since her visit and I'm ecstatic to say "Stella" is up and running around the house like her old self (although now she's totally spoiled). It saddens me to think, I was moments away from letting my ex vet put her down, as he so compassionately put it. I can't recommend Stuart Animal Hospital any higher. Their staff was wonderful and their approach to a wellness plan is well thought out and very refreshing. Best of luck, we'll be seeing you soon. Thanks again, Daniel and Stella Gore. Dear Dr. Katz, I can't begin to thank the entire staff of Stuart Animal Hospital enough for the wonderful care you provided for Barney. We would never have been able to have him with us for as long as we did if it wasn't for your expertise and willingness to investigate all possible courses of treatment. When he reached the end of his 9th life, I was extremely impressed and touched with how beautifully Pet Angel returned him to us. All pets deserve the best medical attention possible, and you certainly go above and beyond to deliver just that. I feel so very fortunate you selected Stuart to open your hospital! Can you please tell me your philosophy on declawing kittens. Is this no longer performed? Thank you very much. Sincerely, Diane Gueratin. I can not tell you how happy I am that I found Dr. Ortiz. Margot, my Bichon was almost totally paralyzed in both back legs when we came to Stuart Animal Hospital. I was so afraid that I was going to lose her. After less than two months, Margot is now walking around, able to potty on her own and is back to being herself. As Margot is such an important part of my life, he not only saved her, he saved me too! Want to say thank you to Dr. Katz and everyone at Stuart Animal Hospital for the care and love given to Brandy this week before and after his surgery. He is doing really great. Again thanks for everything. 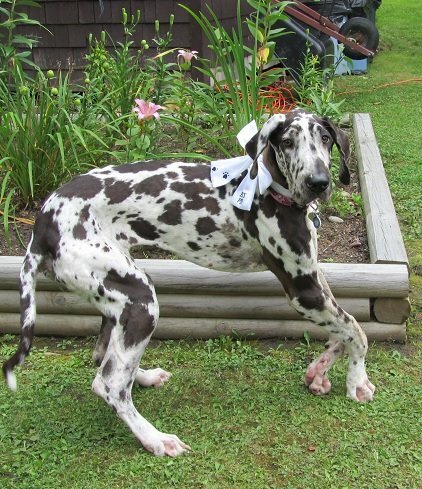 Comments : This is a picture of my dane pup Ruth Ann today. Because of Dr. Oritz's deep devotion, love and concern for his patients, Ruth Ann now does all the things any puppy should be doing. With Dr. Oritz's skills and knowledge of medicine and acupuncture, Ruth Ann loves life, she runs, jumps and plays. I can say Dr. Oritz saved her life. Comments : Stuart Animal is a great place full of compassion and knowledge. I am a volunteer with Southern States Mastiff Rescue and over the years have taken my rescues to Dr Ortiz, who has treated everyone of them with kindness, many have been very sick and with his help we have brought them back to full lives. He has treated several of my dogs with acupuncture and all have done extremely well. He always is there to ask questions and find out answers or have discussions on what my be best for my animals. It is wonderful to have Dr Ortiz and Dr Katz in our animals corner. Very much appreciated! Comments : On June 15, 2010 our dachshund woke up in the middle of the night with a very bad back pain, and could hardly use her back legs to walk. Took her to our vet and he said with this type of disc disease she would need surgery, which we could not afford. He put her on steroids, and said if she did not get better then our other option would be to put her down. Once our daughter-in-law heard this she started doing research on the computer. Found some info about acupuncture. Found the only one in our area-Stuart Animal Hospital, so we decided to call. We had nothing to loose, and the treatment was affordable to us. We made an appointment with Dr. Ortiz, and after 1st visit we noticed a remarkable change. Within one month up and walking, and at times running again ! We have our baby back. Praise God. Many thanks to Dr. Ortiz and our Daughter-in-law (Julie) that our prayers were answered. We are very pleased with Dr. Ortiz and the staff at Stuart Animal Hospital. We would highly recommend them. Acupuncture has made believers out of us. Its wonderful to see our dog walking and running again with no pain. Thank you Dr. Ortiz. Also this would have made our granddaughter (Ella) very upset to have lost Missy Thank you!! Comments : Ok, here is the second part of our story. We have three long haired Dachshunds. Marley, whose story is below, Rasta and Kingston. In May of this year, Rasta developed IVDD in the lower part of his back. He was completely paralyzed in his lower back and legs. He had no control of his bowels and bladder and could not walk at all. After the success we had with Marley and his acupuncture, we immediately called Stuart Animal Hospital. They x-rayed Rasta and it was a disc problem. We were devastated and again there were lots of tears and doubts, you would have thought we would have learned about not having doubts with Marley's treatment. Dr. Katz spoke with a neurologist, but was told that the surgery may only be 48% successful, plus the cost would have been $5,000.00. Dr. Katz recommended that Rasta not get the surgery and Dr. Katz and Dr. Ortiz were very aggressive with the acupuncture for four days straight. To date, Rasta is still receiving his acupuncture treatments and his Chinese herbs. We are doing therapy at home with Rasta, massage and some swimming. The good news, Rasta is walking and running and has complete control of his bowels and bladder. He is still a little wobbly, but we feel that Rasta is 98% improved. We cannot express how happy and how wonderful the staff and doctors are at Stuart Animal Hospital. Both Marley and Rasta look forward to their acupuncture treatments and their visits with all their friends at Stuart Animal Hospital. Comments : In November 2007, our long haired dachshund, Marley, developed a neck problem . He could not raise his head, couldn't look up at us and would whimper when somebody would pick him up. It was obvious he was in pain. We took him to a local animal ER and had x-rays done and were told it was a problem with a disc in his neck area. I had read on a dachshund web site about IVDD and acupuncture. After doing much research, I came across the web site for Stuart Animal Hospital. We made an appointment and met with Dr. Ortiz, who really took his time and fully explained the acupuncture procedure. They were aggressive with the acupuncture treatment but Marley didn't progress as fast as we thought he should, no fault of Dr. Ortiz. With many tears and much apprehension, we continued the treatments. We thought maybe we should go through with the surgery process, which is very expensive and quite a bit more of a healing process and there was a chance the surgery wouldn't work. Dr. Ortiz would spend much time talking and explaining to us the acupuncture procedure and what we should do, etc., and we kept up the acupuncture and the Chinese herbs and therapy. After a couple of months of the acupuncture, Marley started to show improvement and we would only take Marley for a treatment when he needed it. It's been a year since Marley's last acupuncture treatment and so far no problems, he has fully recovered. We believe 150% in the acupuncture and Stuart Animal Hospital. The staff, Dr. Ortiz and Dr. Katz are wonderful with all pets that come through the doors. I love that when I walk in the door even if I don't have one of my dogs with me they call you by name and ask how your pet (by name) is doing. The staff and the doctors are caring and don't think anything about giving your pet a kiss. We love Stuart Animal Hospital and all their staff and doctors and wouldn't go anywhere else unless they tell us we have too. Comments : Hi Everyone, I am just writting in behalf of Mickey, our 12 year old Rat Terrier. He adopted us about 5 years ago, we didn't know much about his medical history, and it turned out that some liver issues and severe spinal arthritis came along. We are so proud of him because he graduated as a Therapy Dog and enjoyed some agility and rally classes. We can't thank Dr Ortiz enough for his compassionate care of Mickey, probably without the accupuncture he would not be as active as he is right now. The treatment helps not only for the arthritis , but the liver and even some nightmares he was having from time to time. This is the best - combination of chinese and traditional medicine. THANKS AGAIN ! Comments : Hi. Our names are Annie and Hercules. We are Yorkies who live with a Shih Tzu named Penny who is getting acupuncture for arthritis. We really wish she would quit! Before the acupuncture, things were nice and calm but now she can run and bulldoze us and generally make our lives miserable. She even unties our mom's shoes and pulls on her pant legs when she is leaving the house. We really are happy she is feeling so much better. Comments : I have an almost 12 year old Rottweiler named Abracadabra. She is a working Therapy Dog and has mild to moderate arthritis which slowed her down at home and in her "work". She was having difficulty getting in the car, on the bed, etc. and her spirits seemed a little down. She stopped wanting to play with her 2 year old granddaughter and the list went on. Her other vet put her on Rimadyl and some natural supplements. She also suggested Abra would be a good candidate for acupuncture which led us to Dr. Ortiz in February. We LOVE Dr. Ortiz and the entire staff! Abra looks forward to being a "pincushion" every few weeks and I think she's put 2+2 together that those needles mean she'll feel better. It's been quite remarkable what this has done for her. I wasn't expecting her to become a leaping puppy again but she IS very engaged in her life again, hops in the car, on the bed and has the stamina to take walks, visit her nursing home patients and read with kids again. She instigates play with her granddaughter dog and gets up easily after laying down. She looks great and acts very happy with a lot of wagging going on . She's off the Rimadyl and is on a variety of natural supplements which will do her no harm. Dr. Ortiz is an excellent diagnostician, listener and is genuinely concerned about Abra's well being. We truly appreciate how much time he spends with us and his patience in answering questions. I would recommend Stuart Animal Hospital and this treatment to anyone. My goal is to have the oldest Rottweiler ever and Dr. Ortiz is helping us along that path. Thank you very much and see you in July! Comments : You can see Guy's story on the WPBF video link on the home page. Our "Lil Guy" had a birth defect or nerve damage in his rear leg. Dr. Katz's acupuncture produced immediate results. And Guy loves his treatments. The next day we always saw clear improvment in his leg motion....plus he is always more active. After six weeks we need another treatment. Since Guy doesn't know he's had a treatment that should do something, the positive effects we see are valid. More recently we have been fighting cancer. Dr. Katz has included this in Guy's treatments. Despite radiation and chemotherapy, Guy has been spared any ill effects. While Guy has positive results from acupuncture, his "brother" Mac is neutral on it for arthritis. Talk with Dr. Katz. Follow his advice. Give the treatments a chance and react to your results. Guy also has been treated by Dr. Ortiz-Umpierre. As part of the doctor team, he compliments Dr. Katz very well. The entire staff at Stuart Animal Hospital reflect Dr. Katz's concern for their patients. A visit is like being with family. We recommend Stuart Animal Hospital for both specialized treatments and general vet care. If acupuncture or holistic treatments are needed to augment an outside care program like our cancer program, they readily work with your primary vet. And if you need a vet, Stuart Animal Hospital provides total care. By now it should be clear we are very pleased with Stuart Animal Hospital. Not only do they provide great care...they do so with the concern and compassion that makes dealing with illness easier. We also have been fighting cancer. Dr. Katz has taken this into consideration during Guy's treatments. Despite radiation and chemo, Guy has not shown any illness. The entire staff at Stuart Animal Hospital reflect Dr. Katz's concern for their patients.